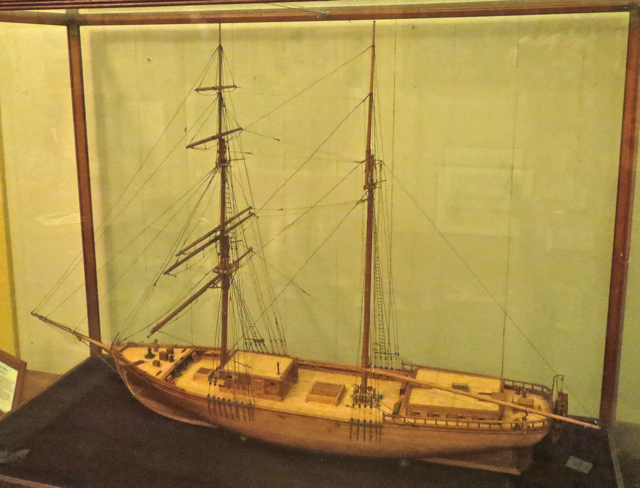 Size: 35" x 48" x 19.5"
Once the fastest ship from San Francisco to Tahiti, the Brigantine Galilee was built in Benicia shipyards in 1891 by Matthew Turner, one of the Bay Area’s master boat builders. She began her career on the packet line between San Francisco and Tahiti, carrying freight, passengers, and French and U.S. mail. On her maiden voyage, she set a record of 21 days for the return trip from Tahiti. In 1905, she began a second career as a research vessel of scientiﬁc exploration by the Carnegie Institution’s Department of Terrestrial Magnetism. In 1933, the Galilee was beached in Sausalito, in what is now known as “Galilee harbor,” marking the end of her sailing days. 35" x 48" x 19.5"